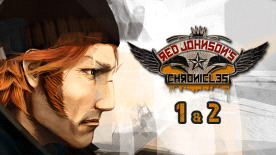 njoy both Red Johnson's Chronicles and Red Johnson's Chronicles: One Against All in one exclusive pack! Red Johnson's Chronicles. Get 2 Games in 1! You play the role of Red Johnson, a private detective who is trying to find his place in the corrupted city of Metropolis. You are taken on by the police who want you to solve a murder with no corpse. Discover Metropolis, its unique atmosphere and get to know the rules quickly if you want to survive! It's up to you to look for clues, interrogate the witnesses and put the evidence together in order to find the perpetrator.You'll also have to use your logic to solve the different enigmas, and occasionally, you'll have to use your fists. Red Johnson is a private detective who knows how to make himself popular. When you solved your last case, you got the Mafia's attention... and they put a contract out on you. Your new friends are going to do everything they can to find you!